The Big Friday effect is what I have called my observation that more mail is delivered on Friday than on any other day of the week. It became apparent very quickly as I began to analyze my USPS mail and has remained through the entire year that I’ve been conducting this mail-counting experiment. 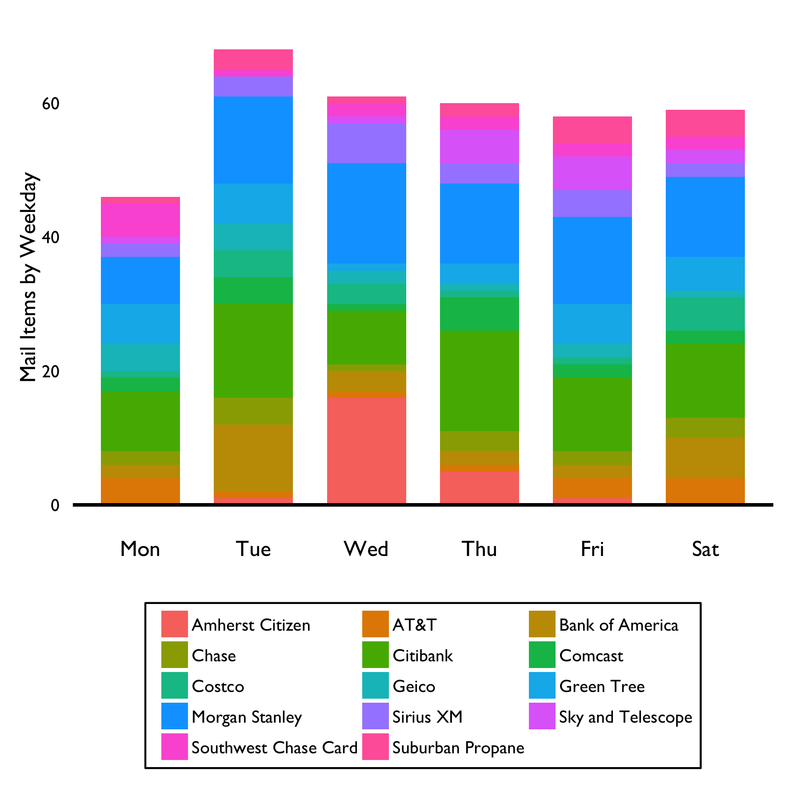 You can see the Big Friday effect in the figure below, which plots the total number of pieces of mail I’ve received by weekday. It is a curious effect that has an interesting cause. 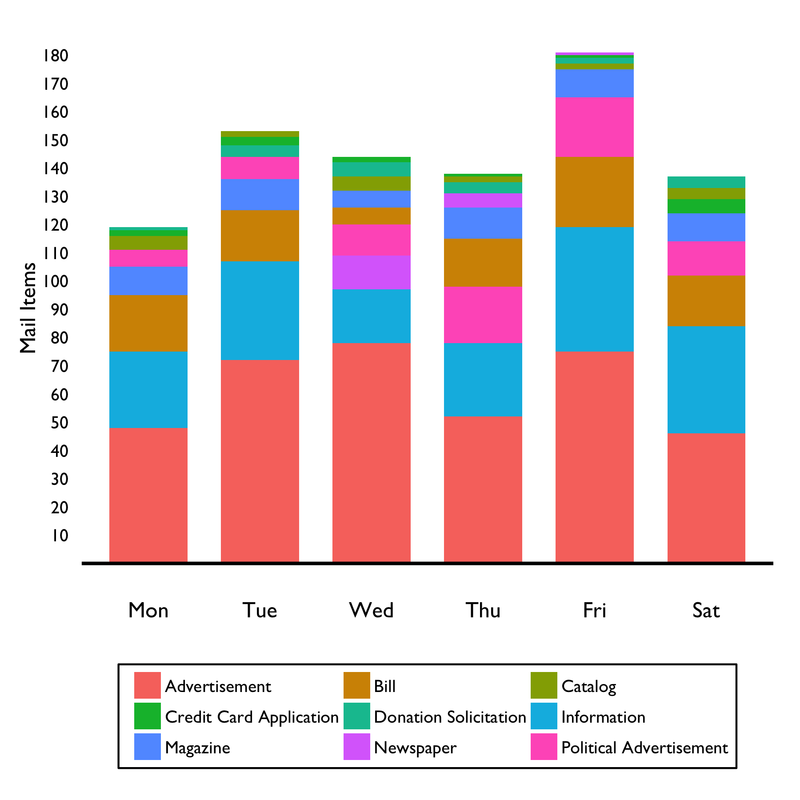 The quantity of mail, by category, by the day of the week it was delivered. Notice that Friday is significantly higher than the other weekdays. 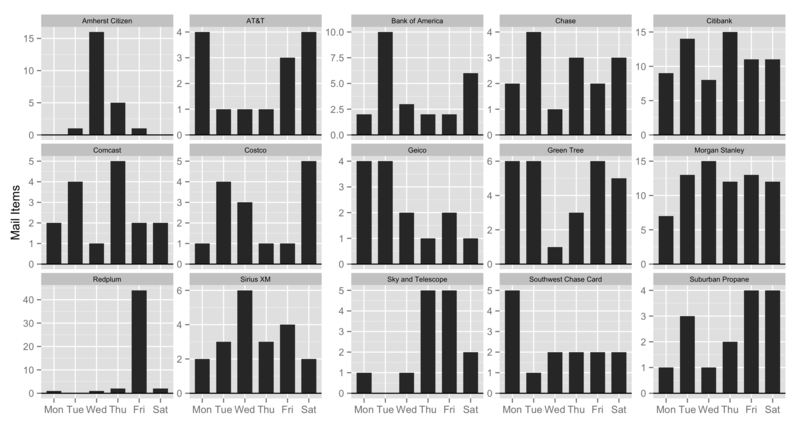 I wanted to look more deeply into the weekday distribution to understand what is behind Big Friday. 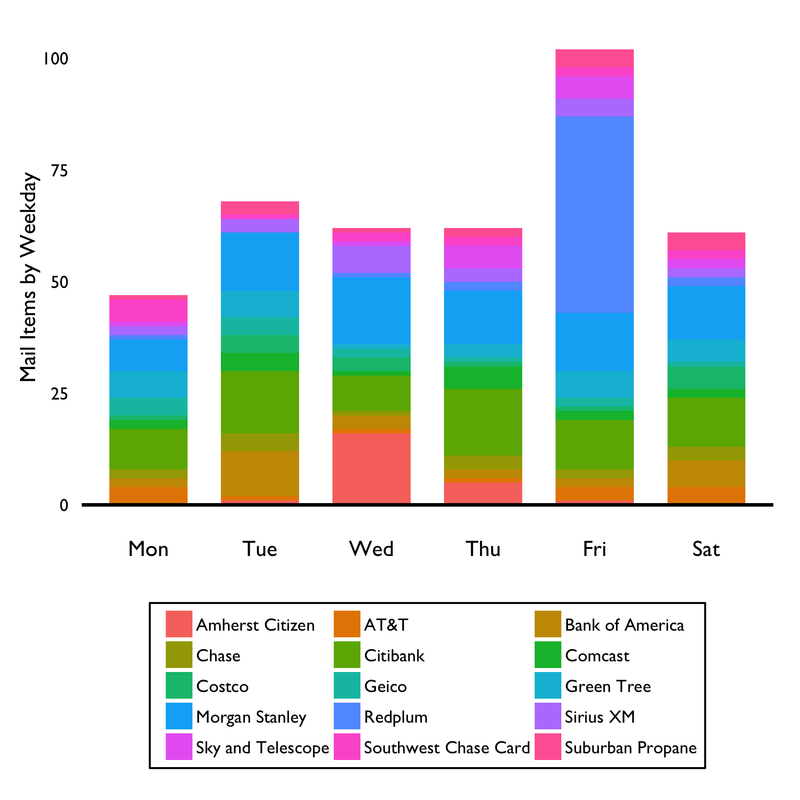 I analyzed the mail from individual senders to see how it was distributed throughout the week, restricting the analysis to the top 15 largest senders (see below). This limits me to senders with mail volumes of about 1 item per month or more. Any sender with less mail volume than that won’t be able to have much of an impact on any given day. 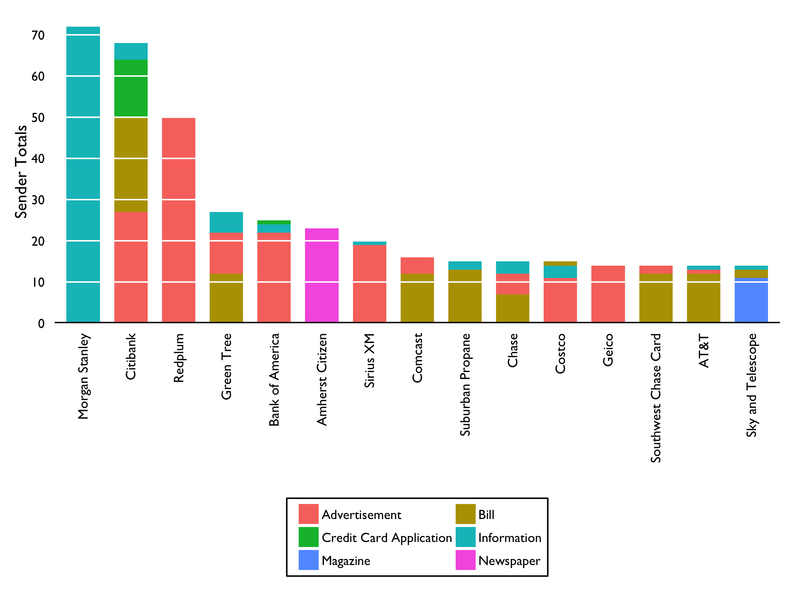 Mail totals for the top 15 senders of mail (to me), broken down into categories. Plotting each sender’s mail into weekdays is revealing. Most of the them have mail delivery distributed throughout the week, which is what you would expect for a mostly random sending process. There are two notable exceptions — they are the senders with the majority of their mail deliveries concentrated into one weekday. The weekday mail totals for the top 15 senders. Note that the y-axes all have independent scales. Note the scale for Redplum. The Amherst Citizen is a local newspaper which is generally delivered on Wednesdays. This does give Wednesday a boost in the top figure, but it isn’t a huge contributor because it doesn’t come out every week. It is also not that reliably delivered on Wednesday, with Thursday deliveries being about 1/3 as many as Wednesday’s. But look at Redplum (lower left), the well known junk mail merchant. With 44 deliveries on Friday alone it dominates the weekday totals. Thursday and Saturday have two each. Considering that there are 54 weeks of mail deliveries in these numbers, Redplum would seem to be very effective at getting advertisements and coupons delivered to households just in time for weekend shopping plans. Mail received by the listed senders by the weekday it was received. Note the large contribution from Redplum on Friday. And then without Redplum’s contribution’s. And so we find that Big Friday is all about one junk mail marketer being very precise with their product’s delivery. Mail received by the listed senders by the weekday it was received. Redplum was removed to illustrate it’s effect. Neat! I did the same thing on a smaller scale when I worked at Sylvania. I saved all the post card packs for a year that came advertising technical products. The total was 35 pounds. Design News and Machine Design were the worst for sending these out.